The 2017 Wimbledon Grand Slam got under way yesterday. 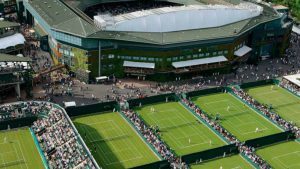 Wimbledon, the oldest tennis tournament in the world, has has been held at the All England Club in Wimbledon, London, since 1877. The number one seed Andy Murray progressed through to the second round but there was a surprise upset for the number 5 seed Stan Wawrinka as he was knocked out by the Russian Daniil Medvedev in an impressive four set win: 6-4, 3-6, 6-4, 6-1 . If you are staying in the area, why not take some Marbella tennis lessons to improve your tennis skills.